Like it or not, most of us do not live in picture-perfect homes with gorgeous kitchens and baths, gleaming wood floors and vast windows that open to stellar views. Take the little California bungalow that Mike and I share. It has some — well, one or two — really great features. The ceilings aren’t spray-on texture sprinkled with sparkly glitter, but wooden planks and beams. The stucco exterior is topped with a tile roof, and tomatoes, artichokes and roses grow rampant around the community pool. So far, so good. But the carpet looks like 40 years of renters have used it to death (because they have), and the kitchen is an absolutely awful rendition of late-1960s design. Our landlord eschews any paint color but white, and the living room comes with an awesomely ugly heater and air conditioner prominently plastered to the walls. Can you relate? Have you thrown up your hands in despair and let your flawed or battered home rob you of hope for a beautiful interior? Well, don’t. Almost all spaces will eagerly reflect our personal style and tell our story if we are willing to overlook, hide or mask their less-than-attractive features. 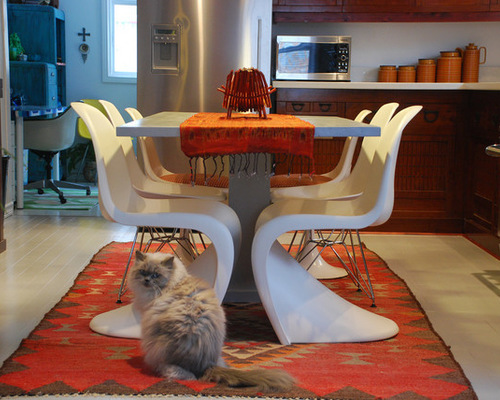 These folks were stuck with dingy and dated flooring, but completely overcame it with a wonderfully colorful area rug. Area rugs are a renter’s best friend. 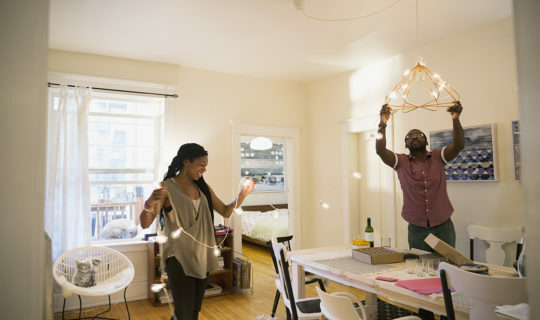 If your landlord allows, take down the invariably ugly light fixture in your dining room and replace it with something you love. This fabric-covered pendant light replaced the existing fixture and made a highly personal statement. If you own your home, replacing the lights installed by the builder may be the first thing you want to do. Fabulous fixtures do not have to be costly, and what a difference they make! While we’re on the subject of lighting: Older homes and apartments have notoriously poor lighting, and almost all have an inadequate number of outlets. Well-balanced lighting is critical to the comfort and function of a room, so please feel perfectly free to add lamps. 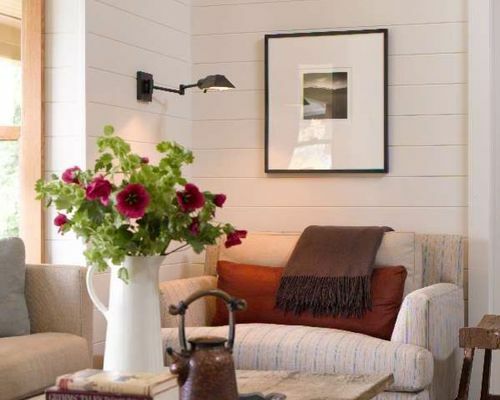 If there isn’t room for a lamp table, mount a fixture on the wall, as you see in this picture. (Just hide the cord with a cord cover the same color as the wall.) A word of caution: Our bungalow complex had a fire because a tenant overloaded an outlet strip, so use good common sense. 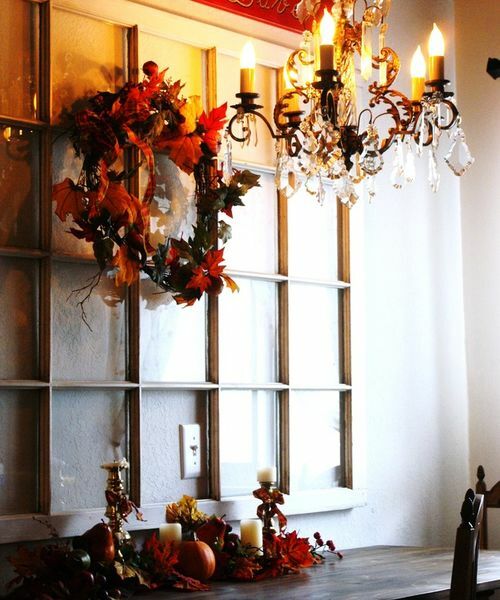 This lovely antique French chandelier has graced our dining rooms in different homes for half of our marriage. So when we hung it in the eating area of our tiny bungalow, we felt immediately at home. But we made sure to safely store the landlord’s light, which we’ll rehang if we ever move. Mirrors are an excellent tool when you want to visually expand an otherwise mundane or dark space, or when you are stuck with those ubiquitous white walls. Look how a spectacular mirror enhances this room. Just be sure your mirror reflects something warm and inviting, as this one does. Speaking of white — or worse yet, builder’s beige — walls, don’t let them discourage your design direction. Make them a perfect do-anything-you-want backdrop. 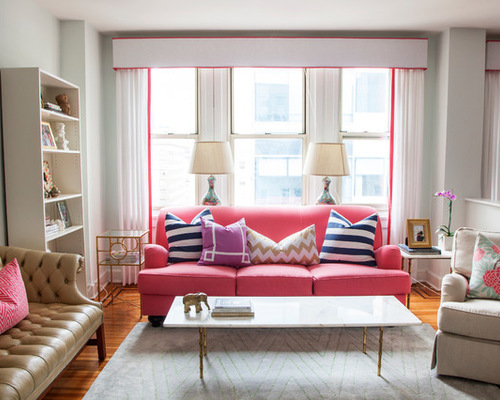 This stunning pink sofa makes you not even notice the lack of color on the walls. And the repetition of the color on the curtain trim is just right.